Plaster of Paris a type of plaster that is commonly used in architecture and art. 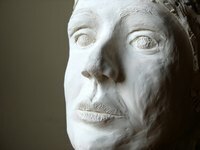 Plaster of Paris can be molded, which makes it appropriate for arts and crafts projects. Parents looking for an inexpensive way to entertain children on a rainy day should consider plaster of Paris. The material can provide hours of fun and it allows children to be artistic and creative. Forget about buying pricey sidewalk chalk, you can make your own. To do this your will need plaster of Paris, a large mixing bowl, a spoon, tempera paint, plastic gloves and an empty egg carton. Put on the gloves to protect your hands. Mix a small amount of the plaster in a bowl with water according to the directions on the package. The plaster should be creamy and stiff (it's best that you start with a small amount of water and add more if necessary. Add a small amount of paint to the plaster. Mix it so the color is dispersed evenly. Pour the plaster in the egg carton. Let it dry 30 minutes then remove the dome-shaped chalk pieces from the containers. Preserve your small child's hand print with plaster of Paris. This project makes an attractive Christmas tree ornament and special keepsake for a parent or grandparent. For this project you will need plaster of Paris, a large mixing bowl, spoon, a small aluminum pie pan, a large paper clip, and plastic gloves. Mix the plaster and pour it into the pie pan. Quickly place your child's hand in the container to make a hand print. Wash your child's hands afterwards. Unfold the paper clip and before the plaster hardens, push the its stem down into the plaster--the clip will serve as the hook. Allow the plaster to dry for 30 minutes before taking it out of the pan. Paint and embellish as desired. Make a flowerpot pen holder with pens that looks like flowers as a gift for your favorite teacher. This project requires a small terracotta flowerpot, plaster of paris, a mixing bowl, a spoon, one or more capped ballpoint pens, green paint, paintbrush, green florist tape, gloves, hot glue gun and glue sticks and colored tissue paper. Mix the plaster according to package instructions. Pour the plaster into the flowerpot. Immediately push the pen caps vertically into the plaster. After 30 minutes, the plaster should be hard. Paint it green. Wrap the pens with green florists' tape. Take the tissue paper and shape it to look like a flower petals and hot glue it to the end of the pen. Place the decorated pens into the flowerpot in its own top.